You can buy drinks with caffeine to rev you up, and now you can also buy a drink with melatonin that says it will help you sleep. Som Sleep is making a splash in the wellness market as a drink that promises to promote relaxation and help maintain a normal sleep cycle. Whether a melatonin-fueled drink is safe and necessary is debatable, according to a registered dietitian consulted by "Good Morning America." 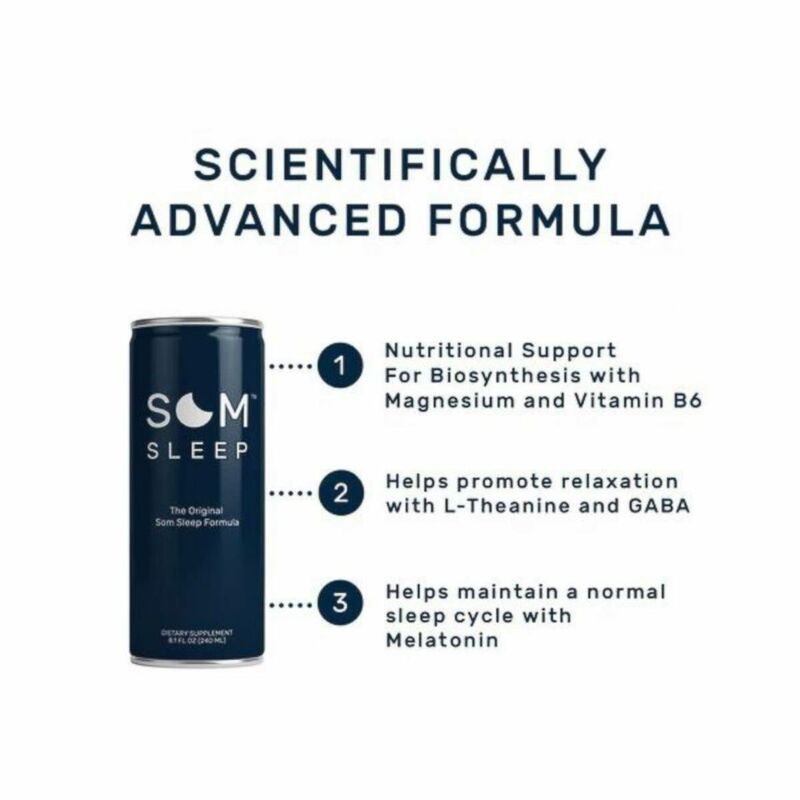 An 8-ounce can of Som Sleep, which comes in regular and sugar-free versions, contains not just melatonin but also magnesium, vitamin B6, GABA and L-theanine. The idea for the drink, the company's co-founder, John Shegerian, said, came when he almost crashed his car into oncoming traffic when he "nodded off" behind the wheel. The product launched in January and is now sold in national retailers like GNC. Som Sleep drinks include melatonin. "A sleep supplement only works if people use it. That's why we created Som Sleep to fit better sleep seamlessly into everyone's lifestyle," Shegerian told ABC News in a statement. "Our 8.1-ounce can is a format people are very familiar with -- it's simple, easy to consume, and you don't need instructions on how to pop open a can. I think that's one of the many reasons we're seeing such great feedback and adoption thus far. Plus, many Americans are chronically dehydrated, which leads to fragmented sleep, so our liquid format helps address that issue also." Shegerian uses "healthy" buzzwords to describe the product, adding, "To top it off, Som is drug-free, non habit-forming, vegan, gluten-free, non-GMO, NSF Certified for Sport ... and the list goes on!" 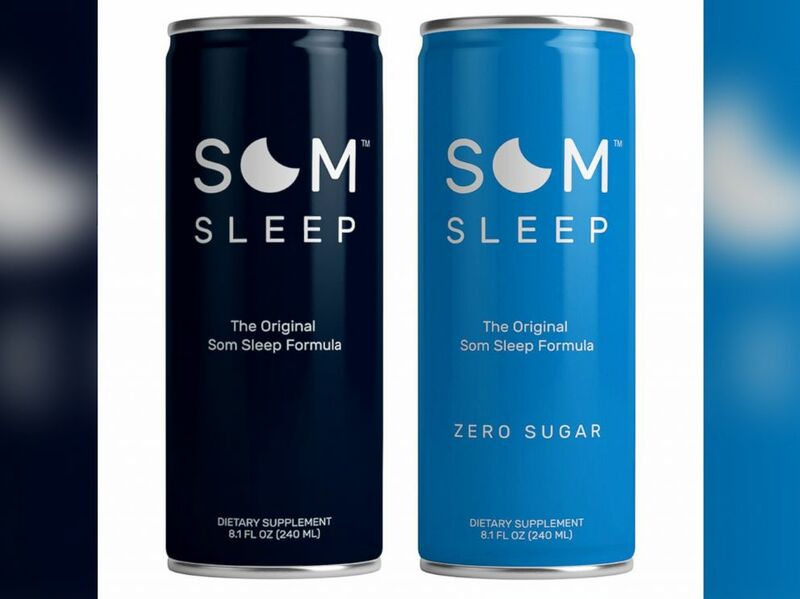 Som Sleep drinks contain 40 calories and eight grams of sugar. 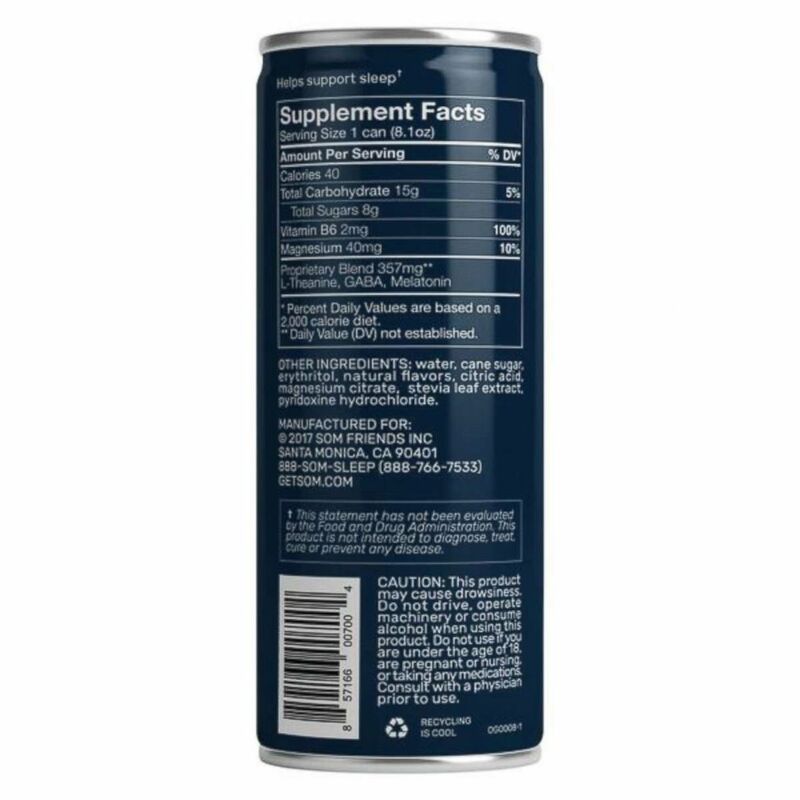 An eight-ounce can of Som Sleep contains 357 milligrams of a blend of L-theanine, GABA and melatonin and 40 milligrams of magnesium, according to the label. If you believe the more than 200 mostly positive reviews on Amazon, Som Sleep has earned a four of out five-star rating on the e-commerce giant’s website. But do you need to spend $9.99, the price of a 4-pack of Som on Amazon, for a good night’s sleep? And are any melatonin supplements a good choice for a good night’s rest? We asked Maya Feller, a New York-based registered dietitian, for her take. Can Som Sleep's ingredients help with sleep? 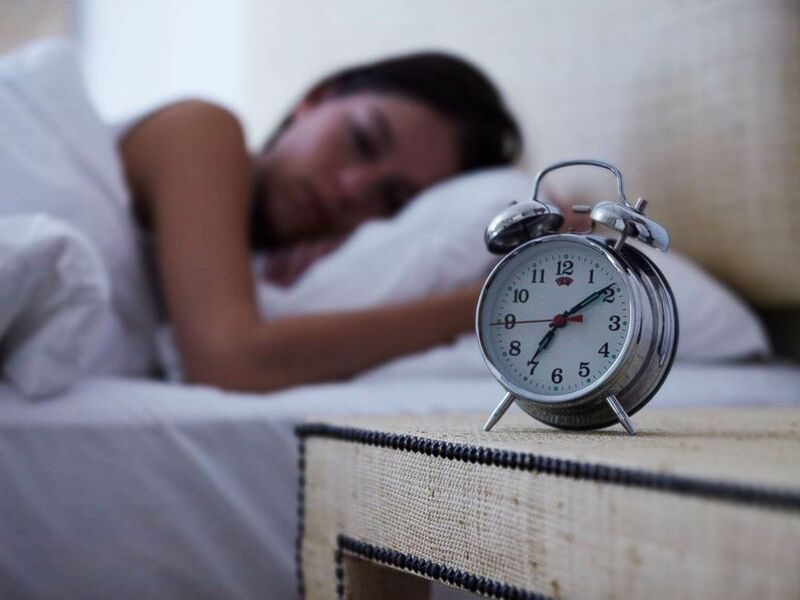 "There is research that has found that each of these supplements can improve either the quality or duration of sleep," Feller said, referring to melatonin, magnesium, vitamin B6, GABA and L-theanine. But there's a big caveat, one that comes with all supplements not required to be tested for effectiveness by any government agency. "The big takeaway is, before starting to take it, because it is a supplement, talk to your healthcare provider," Feller said. Melatonin is a hormone that plays a role in sleep. Melatonin production and release in the brain rises in the evening and falls in the morning, according to the National Institutes of Health (NIH). Short-acting, over-the-counter melatonin does not appear to have clinically meaningful benefits on sleep, research shows. Do people in their 20s and 30s need a melatonin supplement? "Before you start a supplement, look at your sleep hygiene," she said. "Are you engaging in behavior that is stimulating right before going to bed? Are you watching TV right before you go to bed, are you drinking alcohol, are you smoking cigarettes, are you exercising really closely before going to bed?" 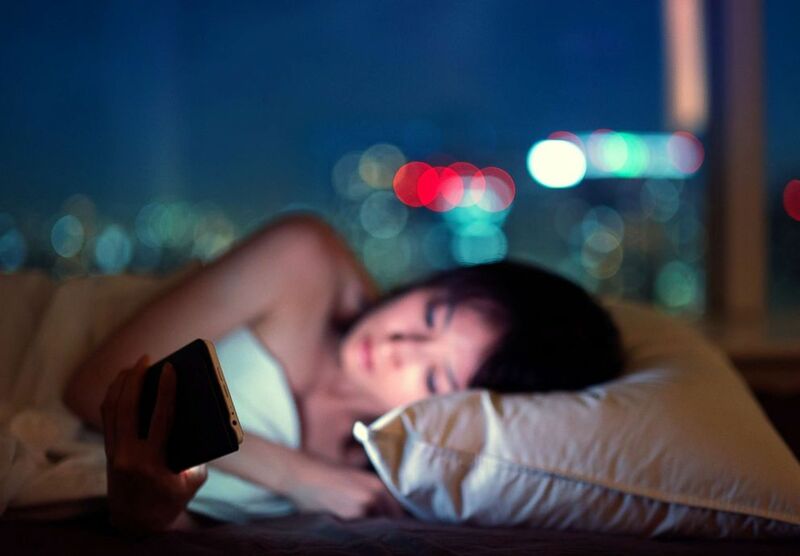 Women in bed at night using her smartphone. She continued, "I would try to modify those behaviors before taking a supplement." What can I do besides take supplements for sleep? In addition to skipping stimulants like alcohol, caffeine and cigarettes before bed, Feller also recommends avoiding eating a large meal close to bedtime. If your own remedies do not work, talk to your primary care physician, Feller advised. "If people are looking to [supplements] because they want to improve their sleep, and there's a problem, they should consider getting help," she said. "Sleep is incredibly important." Some foods, including tart cherries, orange bell peppers and tomatoes, have also been shown to have some possibly helpful levels of melatonin. The hormone, which is usually taken as a supplement in pill form, was associated with a potential risk for depression as well as adverse cardiovascular effects, including arrhythmias, according to Dr. Dima Qato, who led a newly-released study that found the use of so-called "alternative" supplements in kids and teens doubled between 2003 and 2014. 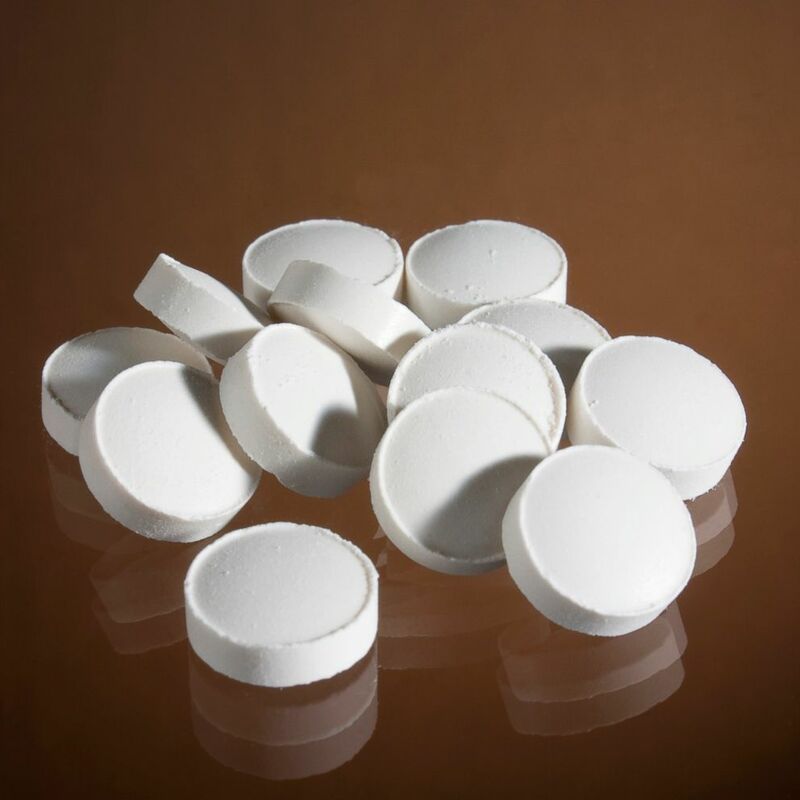 White pills are seen in this stock photo. Side effects of melatonin are uncommon but can include nausea, drowsiness, headache or dizziness, according to the NIH. There is also not much research on the longterm effects of taking the hormone as a supplement. Sleep has effects not just on brain function, but on your diet too. "Sleep is one of those topics where everyone says, 'Oh, I'm so tired,' but over time, not being well rested is detrimental," Feller said. "When the brain is tired, it wants more refined carbohydrates because it's a faster source of energy." A young woman sleeps with an alarm clock next to her bed in this undated stock photo. She added: "People who sleep consistently and engage in relaxation before bed and don't have the TV on, they tend to engage in better health choices all around, which in turn influences things like cardiovascular disease, hypertension and diabetes." Advice from the experts: Low light in the evening will help trigger your own natural melatonin. A nighttime routine and not using the bed as a place to read, play video games or finish up work are all marks of good sleep hygiene. If you've been lying awake for more than about 20 minutes, get up and read in a chair or another room with a dim light. The idea is to make sure that your mind sees the bed as a cue for relaxation and sleep. And how long should you sleep for? There is no "magic number" for the number of hours you should be sleeping each night, according to Feller. The goal, she said, is finding what works for you and consistently going to bed around the same time each night and waking up the same time each morning.